Another unusual Suffolk holiday let, the House in the Clouds in Thorpeness, Suffolk, was built by the Braithwaite Engineering Company in 1923 as a water tower to provide a water supply to the village, pumping water from the mill well and letting it be distributed by gravity in what is a rather flat part of the country. 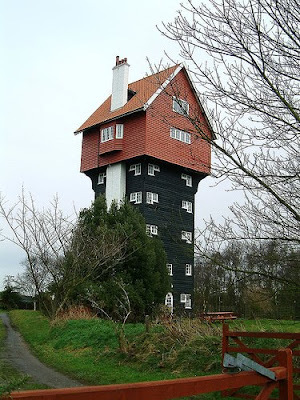 The appearance of the House was added to make the water tower appear to be a cottage, and it continued to be used as a water tower until 1963 when a mains water supply was connected and in 1989, work began to convert it into the five floor cottage which is available for holiday lets today. Wow... this house looks brilliant. Would love to stay there. I love everything on your website. I am new to London and although there is so much to do, I'm not really a fan of the tourist trail; your ideas are much more up my street. I have been using online social discovery sites and apps to help me find my bearings in the city and to meet people, will certainly trial out some of your ideas with some of my new friends.